Would you choose your LMS again? It happens to us all. We adopt learning technology expecting it to make us more efficient, prepared, and successful. At some point we wonder if it’s doing the opposite. Questions can be immediate or emerge over time. Either way, you’re stuck with technology that’s misaligned with where your organization’s going. 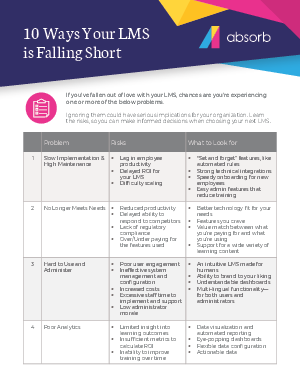 So how do you know when it’s time to make an LMS change? Don’t let your LMS hold you back!